March contains one of the most famous ill-fated days of the year: the Ides. Before 44 B.C., the Ides was actually a festival day. For this month’s Foodbuzz 24×24 (highlighting 24 unique meals occurring worldwide in 24 hours) my friends and I went back in time and sat down to enjoy an ancient Roman-inspired meal to observe the lighter side of the Ides. It might not have been quite fit for an Emperor, but we certainly enjoyed ourselves. Roman meals generally proceeded in three courses ab ova ad usque mela – from eggs to apples. I based the progression of my meal on the three Roman courses – gustatio (appetizers), primae mensae (the main course), and secondae mensae (dessert) – but I served five courses. Though I wanted to stay on the tongue-in-cheek side of the Ides of March theme, I had to bring Caesar in somehow. So, I tracked the five acts of Shakespeare’s Julius Caesar in my courses. My blog is, at its core, about food through time: I really loved the idea of weaving together ancient flavors, modern cooking techniques, and an early modern take on the ancient history. Thought I couldn’t get any nerdier, eh? Wrong! I’m sure you’re all wondering: how on earth would anyone decide to make Roman food? Let alone go about such a thing? To answer the first question we have to dig a little into my past – to a time when I was really into digging. If you’ve checked out my about page, you know I majored in archaeology and classics in college. A lot of classical archaeology takes place in museums these days – where all the statues are – but I was into dirt. 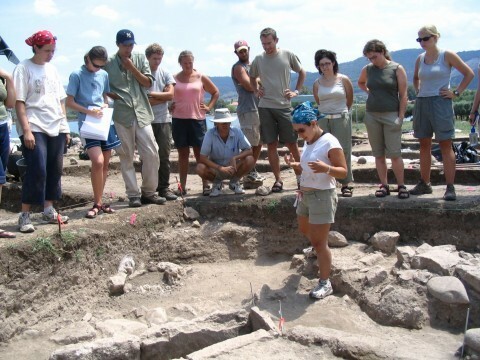 Yep, that’s me giving a tour of a trench at a site I worked on in Greece. I spent a summer on the Aegean, and one at Pompeii. Gosh, I was tan. Anyway, because I liked getting up close and personl with the past, and I hung out with a number of like-minded friends, I came across De Re Coquinaria, by a Roman gentleman called Apicius: the oldest existing cookbook. I’ve dabbled a little in this book through the years, but I applied for this 24×24 with the aim of really getting into Roman food, working up reinterpretations of Roman recipes (to appeal to the modern palate), and setting up a crazy drama-inspired meal. Foodbuzz was kind enough to oblige, and nine of my friends were brave enough to sample the results. I invited gastronomically adventurous acquaintances, and I was pleasantly surprised when several brought out previously hidden bonafide Classics geek credentials – years of Latin study, classes in Roman food culture, weird factoids about emperors. I’m going to begin by passing on a bit of my own geekery, and setting the Roman cuisine scene. Diet, as you might imagine, was very different around when these recipes were collected in the first or second century A.D. – not just because of the lack of modern appliances, but because Romans had and used different ingredients. Some of the things I had to omit completely from this dinner: corn, tomatoes, rice, citrus, processed sugar. I also had to acknowledge that I’d be preparing the kind of meal only rich Romans would eat: only a high-status household would be able to afford the amounts of spice and meat called for in this dinner. Roman cuisine presented strange requirements as well as restrictions: it was filled with flavors and ingredients we don’t use today. Most notable: garum, a type of fermented fish sauce. I wound up making recipes that didn’t include this ingredient; modern cooks generally tend to use Thai fish sauce (nam pla) as a substitute. Fish sauce aside, the most distinct thing about Roman food is its focus on sweet-and-sour combinations: many recipes call for vinegar to be paired with honey or sweet wine must. For spicing, Romans leaned heavily on cumin and coriander; however, they also used some herbs – like rue – which are no longer part of modern cuisine, and which I was forced to omit. Food in the first centuries A.D. was a lot less fresh: without refrigeration, vinegar and spice served to cover up any number of slightly off tastes. Another difficulty with Roman recipes: Apicius doesn’t include amounts. So, the food pictured below (and the recipes I’ll post during the course of this week) are really “inspired by Roman cuisine” if we want to be accurate. I’ll go into recipe development in upcoming individual dish posts: it was quite a process. I had an amazing time, though, and thanks to Foodbuzz’s generosity I was able to incorporate a lot of gorgeous ingredients I wouldn’t normally use in a dinner for ten (pinenuts! muscat! organic lamb!). Romans not only ate different foods – they also ate their food differently. As many of us know from movies, Romans ate reclining. The classic setup was three-to-a-couch, with three couches forming a “U” shape around one large table or several small tables in the middle, which would be tended by slaves or servants. Diners reclined on pillows, as shown in this 19th century reproduction of a Roman wall painting. We dined on couches around a large central table, but did so sitting up – and by necessity, since my apartment doesn’t have room for a real dining table. The atmosphere was informal but convivial. 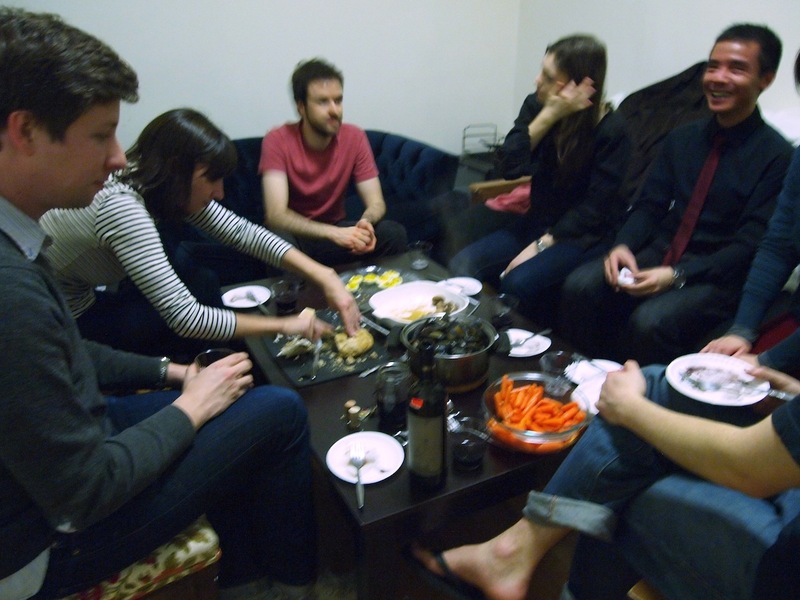 To be honest, the conviviality was partly due to wine. In an age where water was full of refuse, it was often safer to drink alcohol; some Middle Eastern and Northern European cultures favored beer, but the Romans definitely preferred wine. Their wine was different from what we drink today: it was often stronger (Roman writer Pliny discusses one famous vintage that had enough alcohol to “take flame”) and sweeter, and was usually diluted with water. In deference to modern tastes, I served a Primitivo – a southern Italian grape with a long history. 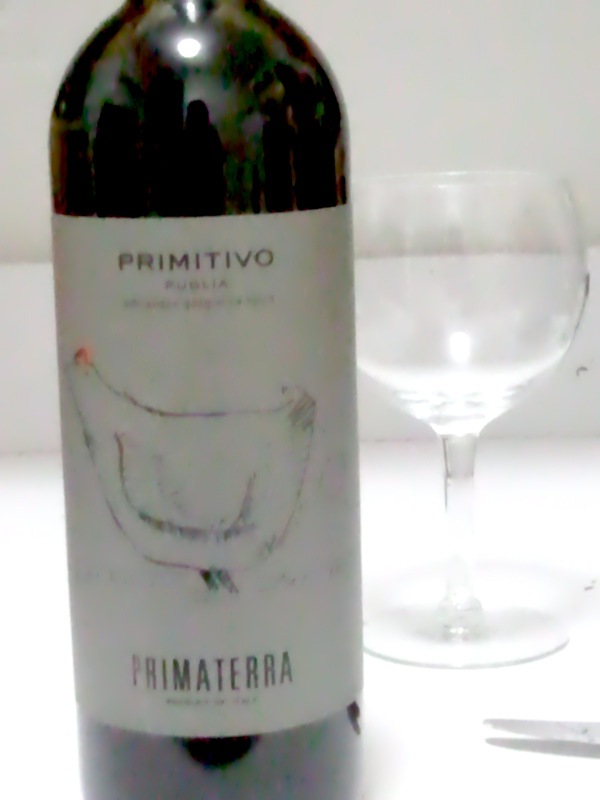 The Primaterra Primitivo 2009 was a great table wine: it was nice and fruity, and complemented the sweet-sour flavors in Roman food well. Also, with a reasonable price tag (about $10), we were able to keep libations flowing freely. So, let’s raise the curtain on this meal, refresh our Shakespeare knowledge, and see some delicious dishes! As we begin, Julius Caesar’s star is rising, citizens are worrying that he is growing too powerful, and the seeds of the plot against him are being sewn. I went with eggs to suggest the beginning of the end. 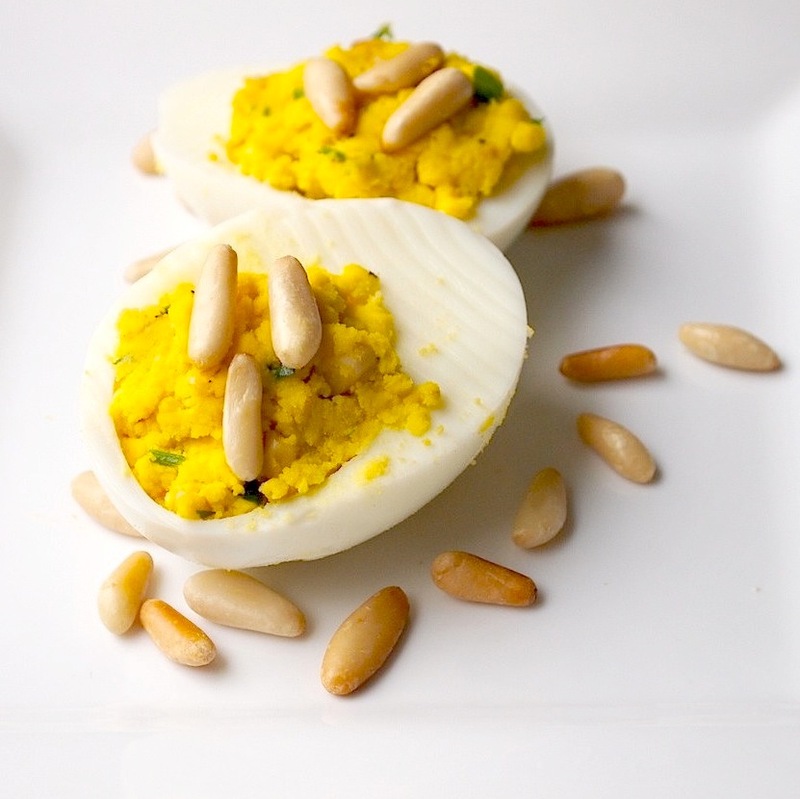 Apicius had a wonderful recipe for a sauce for poached eggs with pepper, parsley, “soaked nuts,” honey, and vinegar; I used pinenuts and turned this into a take on deviled eggs, with olive oil binding the yolk filling in place of mayo. I, of course, don’t have the full household staff of a Roman matron, so I was still running around when guests began arriving. I knew this would happen, and planned accordingly: not only are the eggs symbolic, they’re also easy to make ahead. In addition to the eggs I made bread. 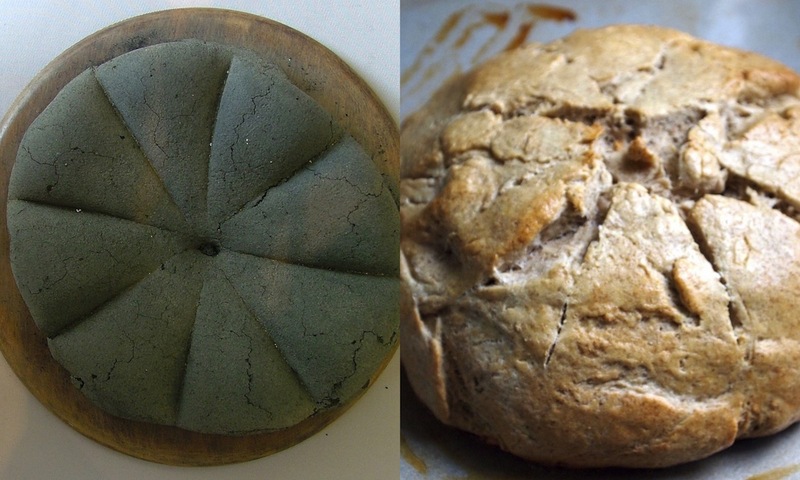 My inspiration was carbonized bread from Pompeii (pictured below, courtesy of Wikimedia Commons) – I just think this bread is one of the coolest finds, ever, from any archaeological site. I made a dense bread with rye flour (a grain the Romans used) and I scored it like the Pompeiian loaf. Along with the bread I served a couple of simple cheeses, of the type that might have been available to Romans: a chevre and a Piave. As our meal progresses, so does Shakespeare’s plot: conspirators plot Caesar’s assassination, and his wife dreams of his doom. A bowl of shellfish, I thought, suggested a group of conspirators each hiding a secret: the mussels I chose to make have delicious sweet flesh hidden by hard shells. I cooked them with leeks in a Portuguese muscat – my nod to the Roman fondness for sweet wines. 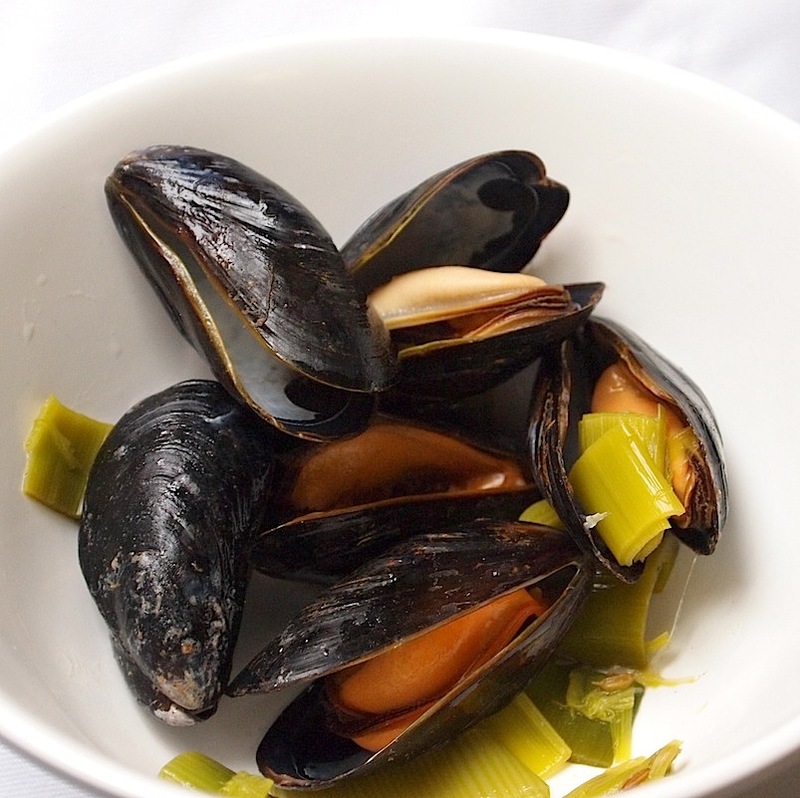 This dish was one of the biggest hits of the evening: the wine complemented the mussels’ sweetness perfectly, and the leeks added a lovely freshness. I have a number of friends who are vegetarian and not fond of fish, so I served some nice veggie salads along with the mussels. 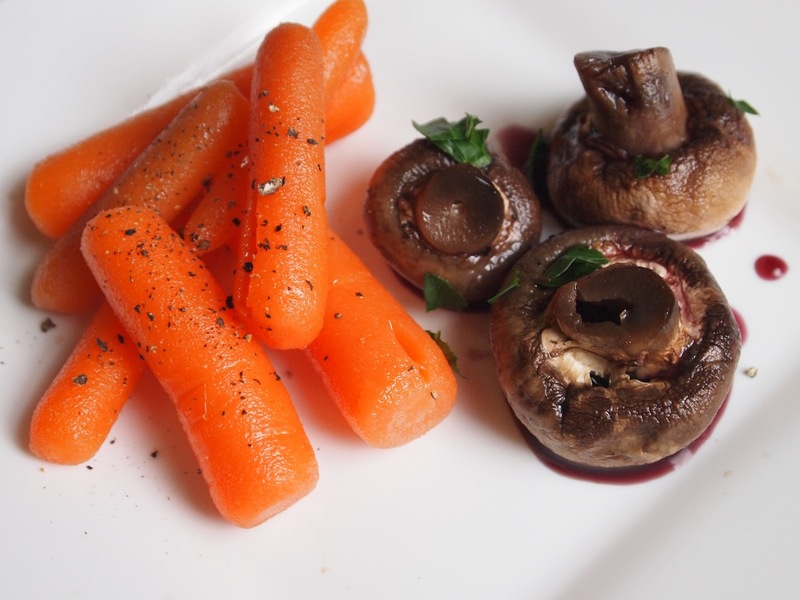 According to Apicius’ instructions, I reduced a few cups of wine with a bunch of fresh coriander in the pot, and paired this with roasted mushrooms. I also made a salad of boiled carrots dressed with oil and vinegar; I used sherry vinegar throughout this meal, partly because I had a bottle I wanted to get rid of, and partly because I thought its sweetness would be the best way to reflect to the sweetness of Roman grape products. Julius Caesar, as we all know, does not make it through his play alive: his bloody demise occurs in Act III when he’s assassinated in the Senate. Mark Antony delivers his speech to the mob angered by Caesar’s death: “Friends, Romans, countrymen, lend me your ears.” For the violent climax of both meal and play, I thought it only appropriate to serve up a bloody roast. Yep, I have a pretty macabre sense of humor. 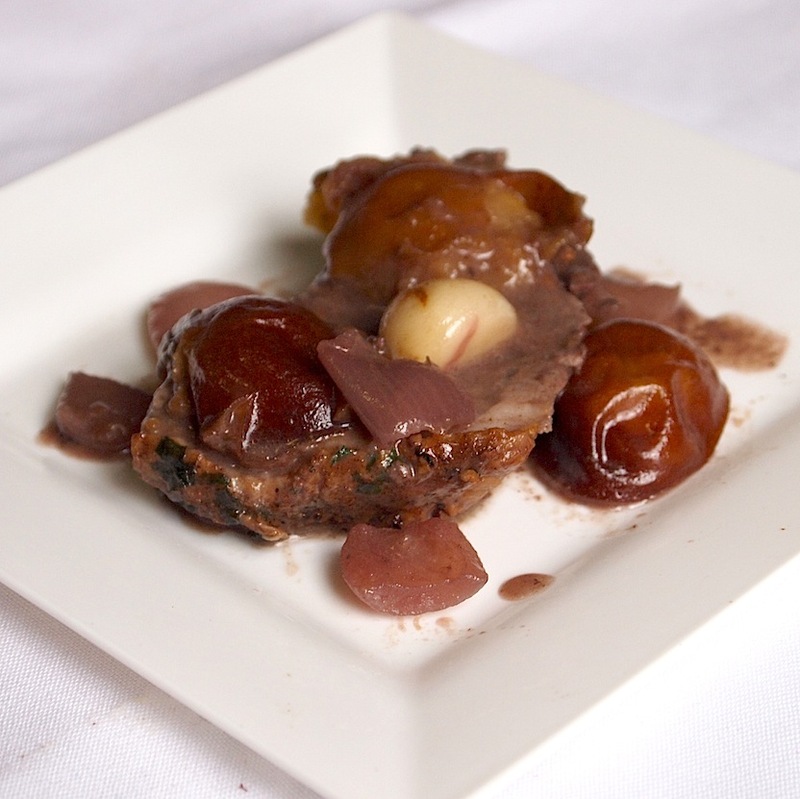 My friends were on board with it, though: I went for boneless leg of lamb, and found a gorgeous, simple recipe in Apicius for lamb roasted with fresh plums and served with wine. I had no leftovers. After Caesar is offed, his betrayer Brutus (you know – of “Et tu Brute” fame) winds up in both personal and literal conflict, haunted by Caesar’s ghost and at war with the Triumvirate formed by Octavian, Antony, and Lepidus. This seemed the perfect point to bring out a really classically Roman sweet, sour, and spiced dish. I made a lentil stew with roasted chestnuts, sweetened with honey, soured with sherry vinegar, and flavored with cumin. 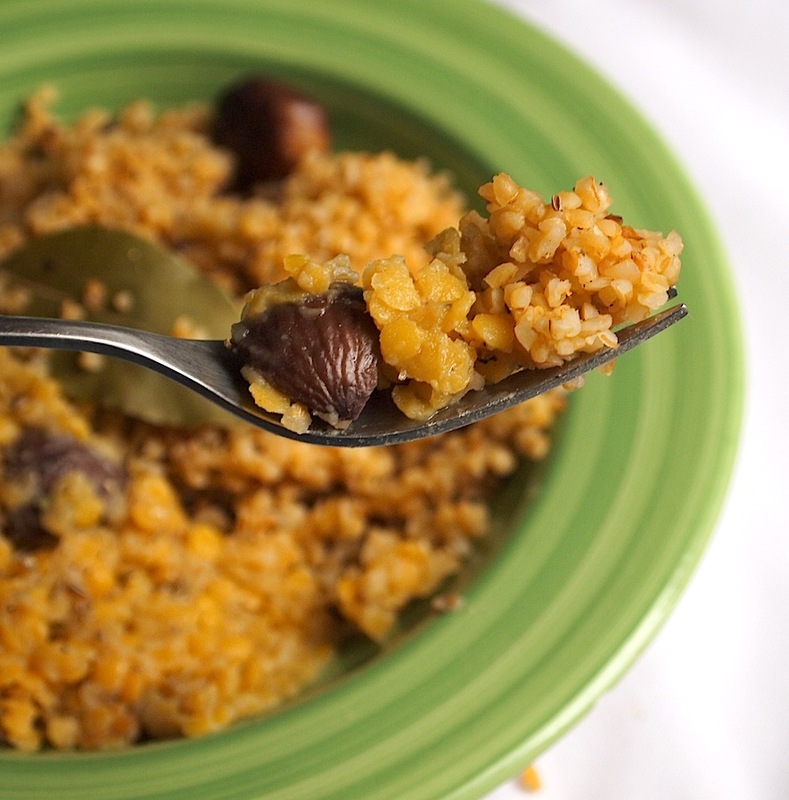 This was served with a pilaf of bulgur, a cereal common in the ancient Mediterranean (and found today in couscous); I actually cheated here and used a Martha Stewart recipe that featured spices which would have been found in Rome. The cinnamon and bay leaves in the pilaf complemented the lentil flavors beautifully and my vegetarian guests were very satisfied. Caesar’s killers get their just desserts, and we get ours! OK, neither the play’s end nor this dish is that simple; I just couldn’t resist the pun. At the play’s close, Antony and Octavian defeat the conspirators at the Battle of Philippi and Brutus falls on his sword. In history, this shift laid the ground for the rise of Octavian (Augustus) and the establishment of the Roman Empire. I went for dessert on the savory side of things, with almonds reflecting the bitterness of Brutus’s demise. 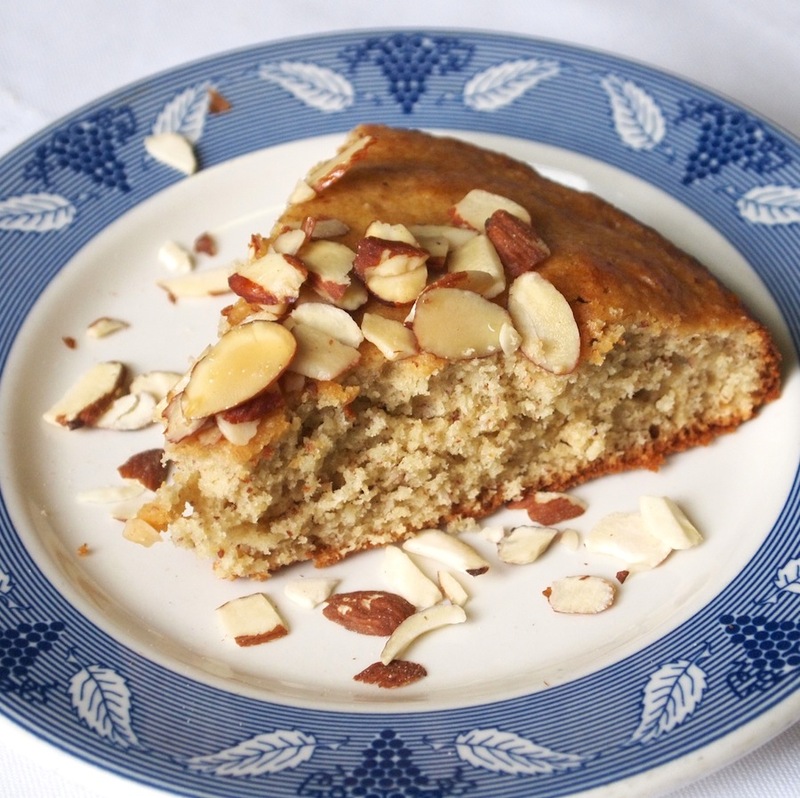 I actually wanted to use a red wine to suggest imperial purple in this cake…but I was just too into Apicius’s recipe for a sweet dish with raisin wine. Flavor trumps concept. I adapted a Gina DePalma recipe and soaked it with a muscat syrup to incorporate Apicius’s sweet wine. Thank you for joining me on this kooky journey through Shakespeare and historical cooking, and thanks, Foodbuzz, for making all this possible. I love serving my food up with a liberal sprinkling of history. I’ve tried, in this post, to limit my extensive capacity for geeking out. If you have questions, though, ask away in the comments! I’ll be posting recipes all week, and will address questions as they come in these follow-up entries. For now, as the Romans said, Vale! Awesome, educational, and salivation-inducing post! Fabulously geeky post! Not only Roman culinary archeological geekiness, but Shakespearean geekiness. Ave! Love, love,love. Such a fabulously inspired and uber-geeky dinner party idea… I can see why Foodbuzz included it in their 24x24x24 round-up! Looking forward to seeing some of your recipes in later posts. I’m especially intrigued by the lamb dish, since I just love the combination of lamb and fresh plums (though the mussels are a very close second). Such a great meal – I’m dying to try that lamb with plums (really I want to try it all, but the lamb looks especially appealing right now). Thanks for such a creative take on this month’s 24×24 – I thoroughly enjoyed reading it. These are fantastic photos of fantastic food. Thank you! Everything looks amazing and soo delicious! what a great party! I love your photos too! This was such a great idea for the 24×24! I love how you incorporate history with food! Your photos are beautiful and everything looks so delicious! Especially those deviled eggs! I have never seen any with pine nuts before! Your photos are beautiful and the spread looks delicious! I learned so much form your post…lovely! Such a fabulous idea for a party…you went ALL out!!!! umm… you’re making me hungry! i love how you tied everything together… i envy your friends! Awesome! Although I was not able to continue my schooling. History, and Archeology remain on my top lists for interests. I also love to find original recipes from History. These recipes are great, and go with your great rendition. Congratulations on a great post and being excepted for it! By the way the term geek sounds so detrimental……how about scholarly? Kicking back on the couch – that really is the way to enjoy your food. Very clever idea for a party! what an interesting and informative post! the food looks DELICIOUS too! This is just fabulous! I love the combination of the archaeology with Shakespeare, and the food looks great. The mussels in particular look wonderful, and I love the replica of the pompeii bread. Great job! I am absolutely in love with and impressed by not only the food you made but the food geekery going on here. That is SO my kind of dinner party! Looking forward to checking out the recipes through the week! The whole concept of your blog is wonderful – I always want to know the pedigree of a food or a dish. Your Ides of March feast is so beautifully photographed and I love the Julius Caesar theme. As a Classics major and accidental total foodie, I loved this post! Very informative, delicious, and fun to read! Thanks for sharing! I was thrilled to find your party ideas, I am putting an Ides of March event together and am sadly the only geek/vegetarian of the bunch….. I will be using many of your ideas…. thank you very much for sharing!!!! !